in-Season Mower service program is designed keep your lawn equipment operating properly by performing the normal maintence recommended by the manufacturer. A $59.95 Pickup and delivery charge will be added to the prices shown in the flyer below. 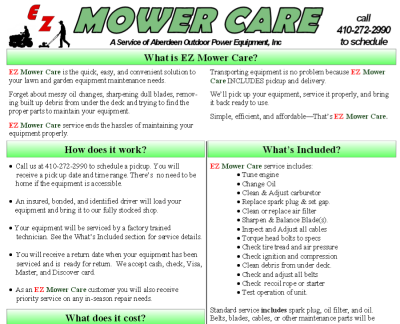 Download the flyer below for all the details and pricing on this In-season mower service.